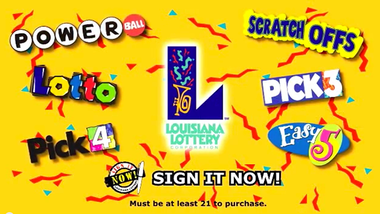 The Louisiana Lottery's number one priority is ensuring the best possible playing experience for those who purchase our tickets. We invite you to put these player protection tips into practice! 1. Sign the back of your ticket immediately after purchase. Signing the back of your ticket is the single most important thing you can do to protect yourself from theft and demonstrate ownership of the ticket. Once a winning ticket has been paid, it is much more difficult to determine whether another individual was the rightful owner. The Lottery must pay the holder of a ticket when it is presented for payment, unless the holder's identification does not match the signature on the ticket. Any alteration to a winning ticket worth more than $600 is cause for a security investigation. 2. Learn how to play and check your ticket. Have an idea of how much you have won before cashing your tickets. Familiarize yourself with game rules and winning combinations found on our website, on scratch-off game tickets and in the All Games Guide brochures in our play centers. Winning numbers are available by calling the Lottery's winning numbers hotline (225-297-2350). They are also broadcast nightly on official Lottery television stations and can be printed from retailer ticket terminals. 3. Watch the Customer Display Unit to verify any winnings. Pay attention to the discreet Customer Display Unit when having your ticket cashed. The small screen will tell you whether or not your ticket is a winner, and if so, how much you have won. If your ticket has won more than $600, the display will direct you to a Lottery office to claim your prize. 4. Ask for a validation receipt. If you are in doubt about how much you have won, ask the retailer for a receipt. If you are told your ticket is not a winner, you may request its return. There is no reason for a retailer to keep a nonwinning ticket. 5. Report any concern right away. To report a problem or concern with cashing a winning ticket, contact us immediately at signitnow@louisianalottery.com. Please be sure to include the name of the retailer, location, date and approximate time of day the incident occurred. Also include the name of the game, other important ticket information and any detailed information about your concern. Using well-respected names in the lottery industry and promises of multi-million-dollar prizes, e-mail-based lottery scams are flooding the internet. In fact, an online survey conducted by the Louisiana Lottery revealed that 72 percent of players had received an illegal lottery scam prize notification in the last year with more than half via e-mail. Email is cheap, instant and virtually anonymous -- a perfect combination for unscrupulous scam artists to promulgate their scheme. To sound "official," these types of e-mail-based solicitations contain special coupon or reference numbers. The notifications indicate that the recipient's e-mail address was selected at random from a list. Because players have 'caught on' to the fact that you need a ticket in order to win a prize, the e-mail may even ask for a ticket number as part of claiming the bogus prize and suggests that the win is based on your purchase of a ticket. Since the Powerball game is so widely played, the chances of the recipient having played Powerball recently are great. Similar scams using other well-known or official-sounding names, such as BMW, Coca-Cola or the "European Lottery" have surfaced across the county, including a mail-based scam that includes a bogus check to supposedly cover the costs of claiming the prize. In these types of scams, the recipient is instructed to wire money to cover the insurance, taxes or other related prize payment costs, which the recipient figures should be more than covered by the check they received. But that isn't how it works.The check bounces and the scammer makes off with your "real' money." 1. The notification asks you to keep your "winnings" a secret. This ploy is to keep you from sharing the information with family members who may help you realize that it's a scam. 2. You haven't purchased a ticket for the particular game or entered the particular drawing in which the prize was won. Every legitimate lottery business model requires the payment of prizes from funds collected through the sale of tickets. Even the IRS only issues refunds based on taxes already paid! Ask yourself, where did the funds come from in order to pay this prize? Did I physically enter this drawing? Remember, there is no such thing as free money. 3. You are asked to make up-front payments of processing fees, taxes or insurance in order to collect the winnings. This is the foundation upon which all scams are based. No legitimate lottery will ever require up-front payment of any kind from winners to claim a prize. Any withholdings, such as taxes, owed by the winner are deducted from the prize funds. 4. You are guaranteed that you will win a prize if you pay to join a pool. Legitimate lotteries do not require that players join a pool in order to play. Also, legitimate lotteries cannot guarantee that your ticket will win a prize. Even if there was a way to "fix the system" in order to win, this would be illegal and you would be participating in a serious crime! 5. You are asked to communicate by phone, mail or email with an overseas entity in order to claim the prize. Gambling across state lines through the Internet, phone or mail is illegal for a reason to protect U.S. consumers. Scam artists that set up shop oversees are more difficult to prosecute. Also, online gambling companies are not regulated and often sell their customer lists to others, including scammers. The bottom line is that if it seems too good to be true, it most likely is. With identity theft on the rise, players should never give credit cards, social security numbers, bank account numbers or other personal information to anyone promising a lottery prize. The vast majority of legitimate jurisdictional lotteries, including the Louisiana Lottery, do not know the names of prize winners until they claim their winning ticket. For this reason, the Lottery will NEVER contact game prize winners directly. Prize winners know that they've won from their ticket, NOT through an email, letter or phone call. The one exception is second-chance drawings, in which the player has written their contact information on the back of a nonwinning ticket and mailed it to an address printed on the ticket to be part of the drawing on an announced date. In these instances, winners may be contacted by phone and registered mail by the Lottery, but will NEVER be required to pay anything in advance to collect their prize. Our Lottery claim form does request a social security number which is needed for prizes greater than $600 to be reported for tax purposes. But most people either present the form in person or mail it to the Lottery's address which can easily be confirmed over the internet or phone book. As the prevalence of email communication continues to grow, so will the number and frequency of email scams, including those promising lottery winnings. And its a profitable venture. In the Lottery's survey on illegal Lottery scams, seven respondents admitted to having been victimized, with one losing $2,800 in hopes of collecting $150,000 and another out $3,000. Nationwide, the Federal Trade Commission estimates consumers are losing about $120 million on these types of scams each year. The best advice is to hit the delete button or report them to the Attorney General's office which has set up a special division to pursue these criminals. Report scams to theLouisiana Attorney General's Consumer Compliant Line. International Lottery Scams information from the Federal Trade Commission. Download our brochure on Prize Notification Scams and help spread the message to family and friends to avoid becoming a victim. Can I purchase Lottery tickets over the phone or by mail? Do you verify the rightful ownership of every winning ticket? How can I tell how much I've won? How can I tell whether I won a prize or confirm the amount of my winning ticket? How can players protect themselves from Lottery ticket theft? How can the public protect itself from lottery scams? If it is determined someone other than the person who claimed a prize is the owner of a winning ticket, will you pay that winner the prize? What can I do if the ticket I purchased has a misprint? What can I do to help establish ownership of my ticket?